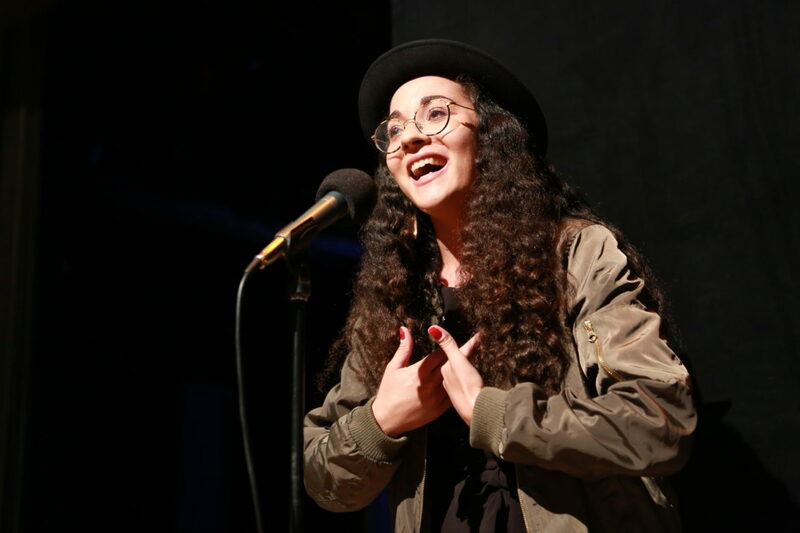 Paloma Valenzuela speaks on the theme of "Welcome to the Neighborhood" in an episode of "Stories from the Stage." 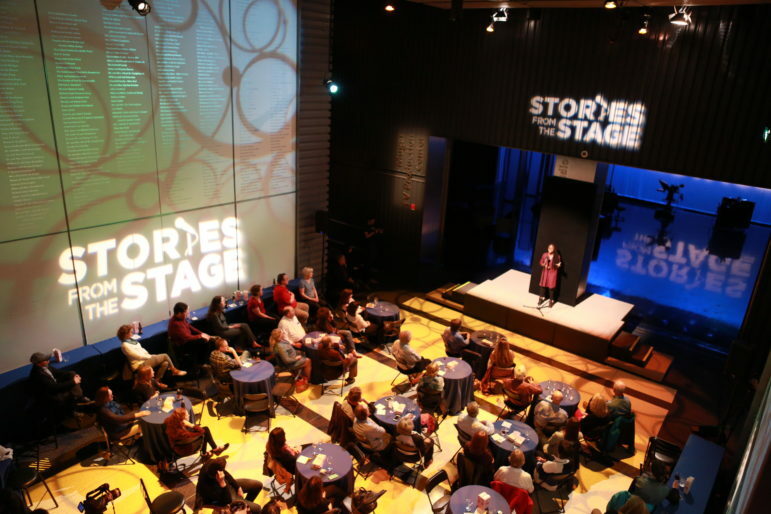 A new series from the multicast World Channel, Stories from the Stage, is bringing storytelling to public TV and inspiring local stations to consider creating live storytelling events of their own. The program, which premiered Monday, presents professional and first-time storytellers as well as interviews before and after their performances. Attendees also get a chance to participate by telling their own stories through an “audience booth” during each taping at WGBH. The idea came from a live storytelling series sponsored by the events department at the Boston station and Massmouth, a local storytelling nonprofit, said Liz Cheng, who oversees the World Channel as WGBH’s television general manager. WGBH, World and Massmouth are partnering on the series production. “We’d also been hearing and admiring what NPR was doing with The Moth and Snap Judgment, and we thought that the World Channel would be the perfect place for a storytelling TV series,” Cheng said. Many of the presentations are “tremendously dramatic,” she said. A Korean-American woman who was held up at gunpoint at her father’s hardware store recalls her emotions as her father “took that chance with my life.” Another speaker from Congo describes his mother “screaming and rejoicing” in a refugee camp at the news that they could leave for America. And a small-town Kentucky native recalls being a high-schooler “desperately trying to stay in the closet” when he was inspired to write his first love poem — to another boy. Although storytelling is popular on radio and podcasts, public TV is just starting to explore the genre. One storytelling series, Ode from Siouxland Public Media in Sioux City, Iowa, just won Current’s Local That Works competition. In the winning episode, immigrants told stories that were also featured on the air and online. The experiences of immigrants and people in other underserved communities also fuel Stories from the Stage. Massmouth disseminates the themes among its members, and World producers curate the series’ speakers. Master storytellers “like to be spontaneous, and we let them do that,” Cheng said. “For the first-time storytellers, we’ll work with them to craft their stories.” Each is under seven minutes. In addition to airing on the public TV multicast channel, Stories from the Stage is also available online and as a podcast. An audience at WGBH listens to a storyteller during a taping. For the WGBH program, producers “transform” the station’s atrium “into a club-like atmosphere” for each taping, Cheng said. Audience members sit at tables and munch on popcorn during the show. Tickets cost $15, “but it’s not a revenue generator,” she said; the income covers costs such as table rentals. Even before the premiere date, Cheng began hearing from public TV stations excited about the potential of hosting local events. She’s currently in “early talks” with seven stations, she said, and is developing a storytelling toolkit for stations. Cheng sees the genre as a natural for television. “My feeling is, the visuals only enhance the experience,” she said. “You see the people, their emotions. When you see the people performing, you cannot ignore the multicultural nature of their experience.” Interviews with the speakers probe even deeper “to present the whole picture,” she said. “To us, that’s a crucial element of the series, that humanity,” Cheng said. Clarification: “Ode: Stories Without Borders,” Siouxland Public Media’s winning entry in the Local That Works contest, was one installment in the station’s ongoing local storytelling initiative. The bimonthly events aren’t focused exclusively on immigration but feature stories on a specific theme. Longstanding efforts to support Native filmmakers has opened a new window for authentic storytelling.